Ozone, which is found in nature, kills microorganisms, destroys organics and breaks down chloramines by oxidation. It’s highly effective in reducing and destroying chloramines in the water. In addition, ozone provides micro-flocculation to aid filtration and noticeably improve water clarity. It also destroys biofilm and reduces the amount of chlorine consumption while maintaining Free Available Chlorine (FAC) residual. Wateco’s Hydroxzone Ozonator can be used in pools with manual or automatic chlorine dosing and also with salt chlorinators. The ozone will contribute to the sanitisation process by reducing the chlorine demand. The combination also catalyses Advanced Oxidation Processes (AOPs) and, as a result, hydroxyl radicals are generated. Put simply, hydroxyl radicals are typically formed when UV rays break up ozone and water droplets and then recombine. Scientists have dubbed hydroxyl radicals as the detergent of the atmosphere. The main benefit of the system is an additional ‘layer’ of sanitisation. Ozone, which is found in nature, kills microorganisms, destroys organics and breaks down chloramines by oxidation. It’s highly effective in reducing and destroying chloramines in the water. 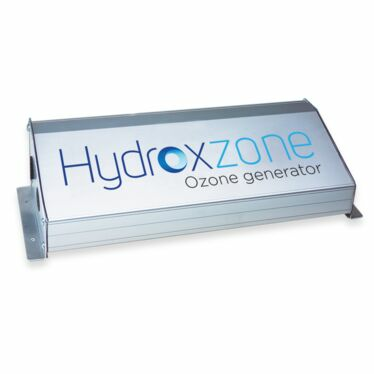 In addition, ozone provides micro-flocculation to aid filtration and noticeably improve water clarity. It also destroys biofilm and reduces the amount of chlorine consumption while maintaining Free Available Chlorine (FAC) residual.